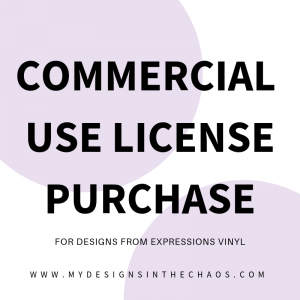 SVG files and PNG files can both be used with your Silhouette or Cricut cutting machines but both for very different things. 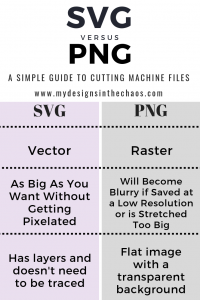 Today I am going to explain the difference and when to use both SVG and PNG file types. The first file type that we are going to talk a little bit about is a SVG file. SVG stands for Scalable Vector Graphic. Basically that means you can make the file as big as you want and it will never get pixelated or blurry. SVG files are great to use with cutting machines because they have layers. You can ungroup, divide, and cut different colors and layers without having to trace at all. The file itself is 3-D so to speak. A PNG file stands for Portable Network Graphic. 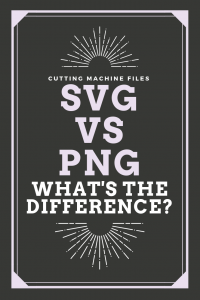 There are 2 main ways that this file type is different from a SVG. This first is that a PNG can get pixelated (or blurry) if it isn’t saved at a high resolution or if you stretch the image out too large. The other is that a PNG file is flat… meaning that you can not ungroup or move layers to cut it with a Silhouette or Cricut. PNG files also have a transparent background which makes them perfect for mock up images. (aren’t sure what I mean when I say mock up? Check out this post where we explain all about them) So if you have a file open and when you go to select cut lines it is only highlighting a box around the image instead of the lines themselves you probably have a PNG file open instead of a SVG. Here is a quick video where we explain the difference in a little more detail. 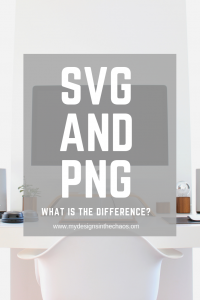 Here is a easy reference guide for you to use when referring to a PNG or SVG file. Basically each file is very useful in its own way. It really just depends on what the purpose is, you are using it for. Did you find this tip helpful? Follow along with us for more digital tips and tricks over on our FB page Digital Divas. Yes, SVG files can only open in the Designer edition of Silhouette Studio or higher.